The main international beach resorts of Thailand are located in the South, on either side of the Malay peninsula. The major destination is Phuket, a large island on the West coast. With an international airport, half-dozen or more large beaches and more than 100 hotels in every price range, Phuket is a mature destination with something to offer just about everyone. On the other side of the peninsula a much smaller island has been developed to rival Phuket. Samui has a small, but award winning, airport with flights from Phuket, Bangkok, Singapore and elsewhere. The mood is more laid back, and the beaches on the East coast of the island are wonderful. Two other locations, both near Phuket, are the Phi Phi Islands and Krabi province coast. The Phi Phi islands are small and must be reached by boat through Phuket or Krabi. Krabi covers the coast of the mainland off which Phuket lies. There are a few isolated luxury resorts here that are particularly popular with honeymooners. Krabi can be reached through Phuket, or to its own provincial airport. The latest 'up and coming' destination are the beaches near the Khao Lak-Lamru National Park in Phang Nga province. Aside from escaping the crowds that flock to Phuket and elsewhere, most people who seek out Khao Lak are divers wanting to make trips to the Similan and Surin Islands. 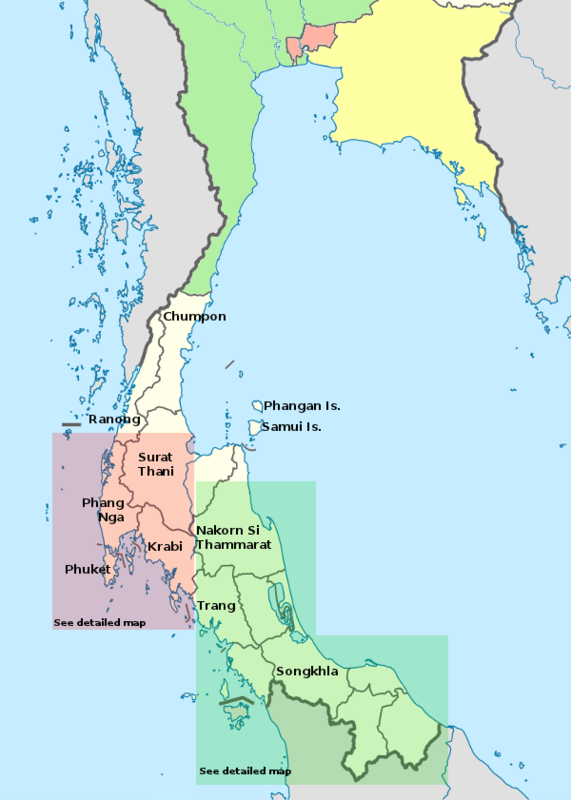 However, this was the area of Thailand hardest hit by the December 2004 tsunami, which wiped out almost all of the resorts along this stretch of coast. The area is recovering, with several new or rebuilt resorts already open. The south is so big, we've divided it into several sections. The Andaman Coast pages provide more details on the areas of interest around Phuket; the Gulf Islands section will give you an overview of Samui, Pangan and the popular diving base of Tao Island; while the Deep South pages will give you a look at the often overlooked area closer to the Malaysian border. Numerous hot springs can be found around Ranong town, and the area has developed something of a spa culture. Note however that some of the treatments (notably black sands) have been found to be more toxic than beneficial, so be careful. A ferry can take you across to the southern-most point in Burma, which is now the site of several casinos.